Helloooooo February! You know why I love February? Because we can stop talking about healthy stuff and get down to what really matters…. This stuff is like crack, friends. Hot fudge crack. 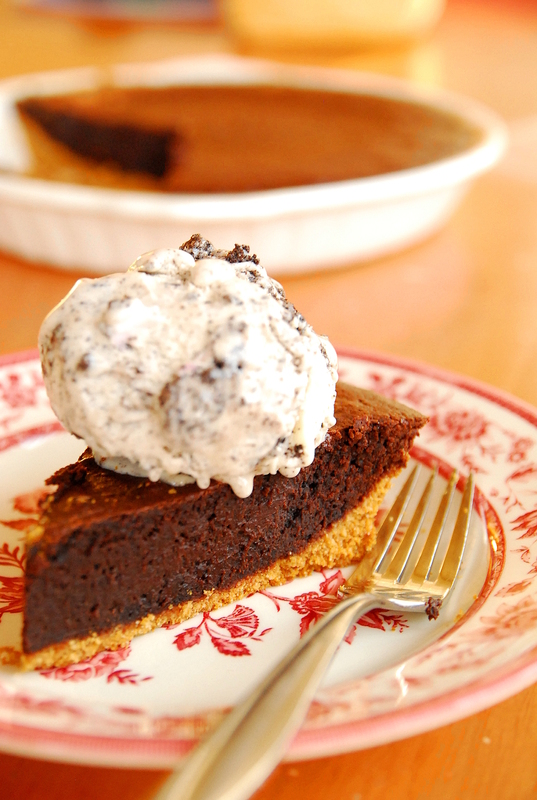 This pie is a cross between a brownie and a piece of fudge. It’s not as cake-like as a brownie. It’s not as creamy as a piece of fudge. It’s sitting there perfectly in the middle of both and I’ll bet you’ve never had anything like it. It’s good hot. It’s good cold. It’s good at room temp. It’s just good. If you make this for your Valentine, I’ll bet you get exactly what you want. Preheat oven to 350 degrees. Grease a 9-inch pie plate. Get your eggs out now so they're not so cold when you mix them with the warm chocolate. Combine sugar and graham cracker crumbs. Add melted butter and stir to combine. Press evenly into pie plate. 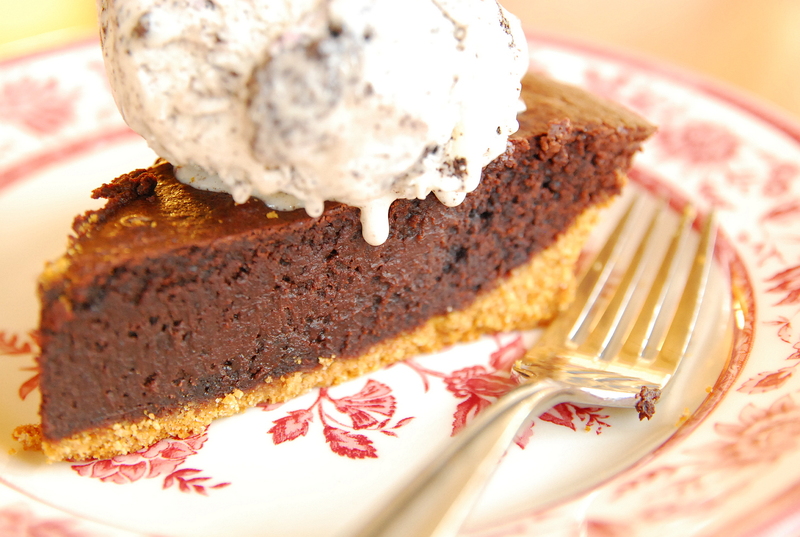 Place half and half, butter, and chocolate in a microwave-safe bowl. Heat in microwave for 2 minutes, stirring once, or until butter has melted and chocolate melts when stirred. Stir until smooth. Set aside to cool for 5-10 minutes, stirring once or twice. Whisk together sugar, cocoa powder, flour, and salt. Add eggs, egg yolks, liqueur, and chocolate mixture. Stir until well-combined and smooth. Cool 10 minutes before serving. Top with ice cream and hot fudge sauce if desired.